This topic explains the steps necessary to configure your environment for Windows Analytics Device Health. Device Health is included at no additional cost with Windows 10 education and enterprise licensing. 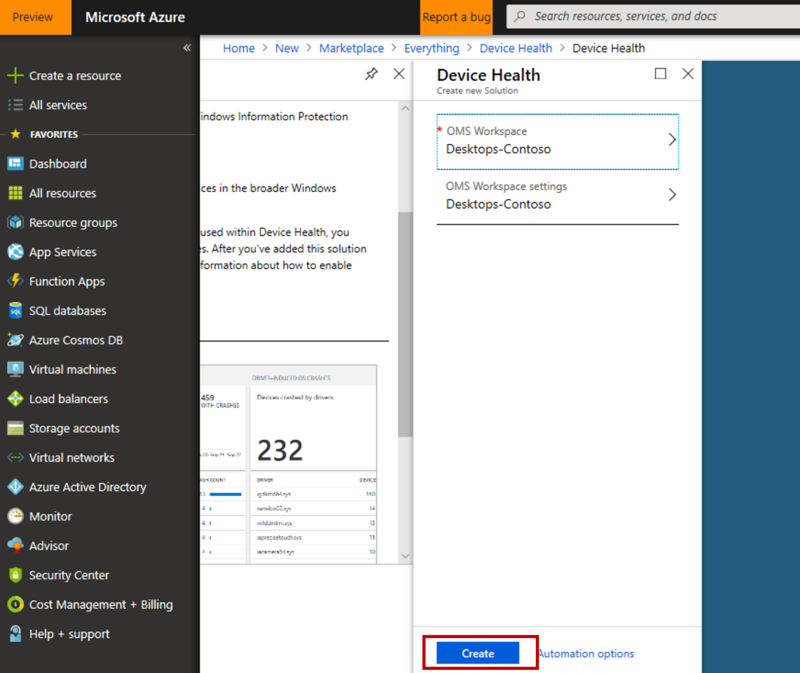 An Azure subscription is required for managing and using Device Health, but no Azure charges are expected to accrue to the subscription as a result of using Device Health. 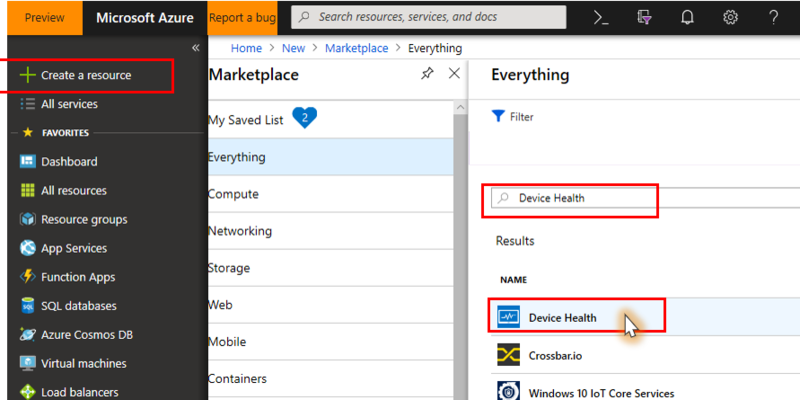 In the Azure portal select Create a resource, search for "Device Health", and then select Create on the Device Health solution. 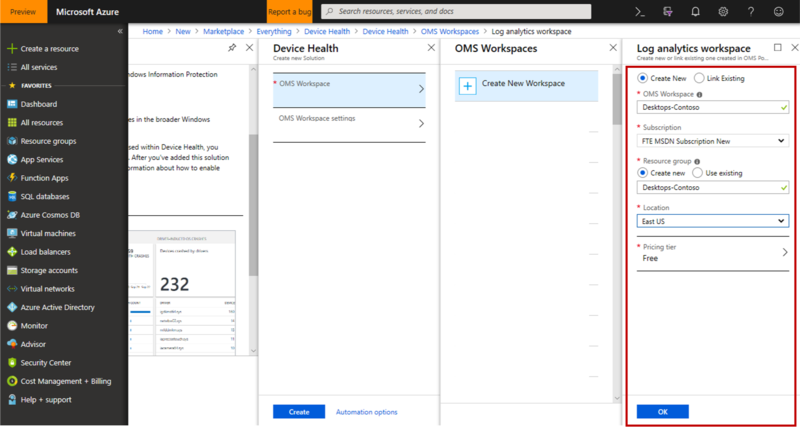 Choose an existing workspace or create a new workspace to host the Device Health solution. If you are using other Windows Analytics solutions (Upgrade Readiness or Update Compliance) you should add Device Health to the same workspace. Now that you have selected a workspace, you can go back to the Device Health blade and select Create. Watch for a Notification (in the Azure portal) that "Deployment 'Microsoft.DeviceHealth' to resource group 'YourResourceGroupName' was successful." and then select Go to resource This might take several minutes to appear. Suggestion: Choose the Pin to Dashboard option to make it easy to navigate to your newly added Device Health solution. Ensure the Windows Diagnostic Data setting on devices is set to Enhanced or Full (typically using Group Policy or similar). Note that the Limit Enhanced policy can substantially reduce the amount of diagnostic data shared with Microsoft while still allowing Device Health to function. For full enrollment instructions and troubleshooting, see Enrolling devices in Windows Analytics. After enrolling your devices (by deploying your CommercialID and Windows Diagnostic Data settings), it may take 48-72 hours for the first data to appear in the solution. Until then, the Device Health tile will show "Performing Assessment." Once your devices are enrolled and data is flowing, you can move on to Using Device Health. 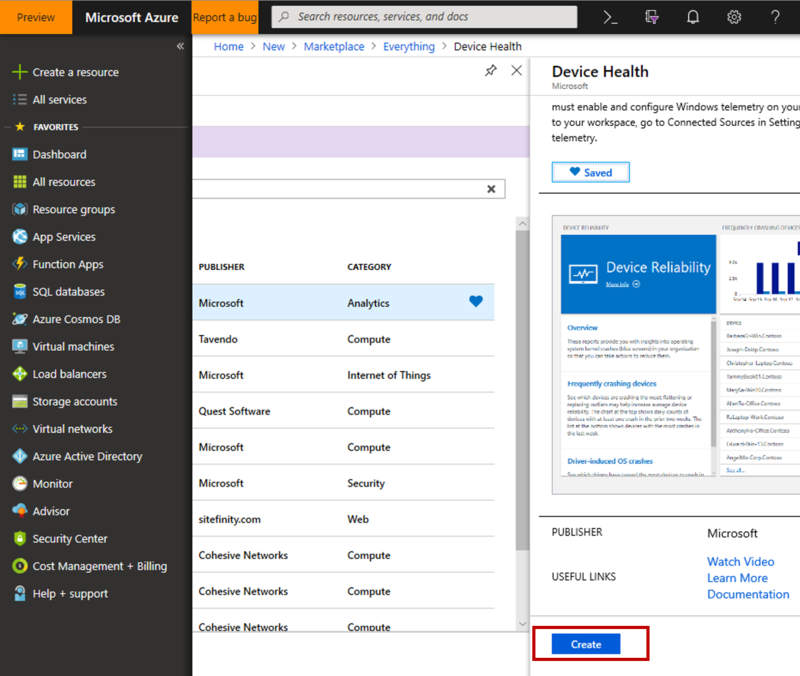 You can remove the Device Health solution from your workspace if you no longer want to monitor your organization’s devices. Windows diagnostic data will continue to be shared with Microsoft as normal as per the diagnostic data sharing settings on the devices.